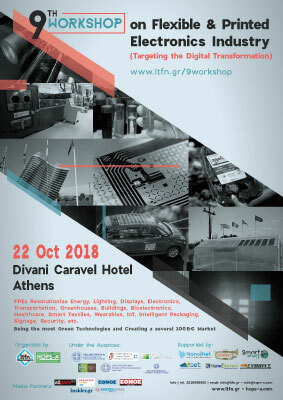 The Work­shop will take place on Octo­ber 22nd 2018, 09.00 am at the Divani Car­avel Hotel, Athens. The Work­shop will bring together Top-​class Sci­en­tists, Engi­neers, Key Indus­trial Play­ers, End-​Users, Entre­pre­neurs, Investors, Pol­icy Mak­ers and Rep­re­sen­ta­tives from the National and EU Author­i­ties to dis­cuss, net­work and estab­lish the Strat­egy and Pol­icy for boost­ing the rapidly evolv­ing Flex­i­ble & Printed Elec­tron­ics multi-​Billion Indus­try in Green Energy, Light­ing, Elec­tron­ics, Auto­mo­tive, Smart Build­ings, Green­houses, Intel­li­gent Pack­ag­ing, Wear­ables, IoT, etc. and its role in the Dig­i­tal Trans­for­ma­tion of the Industry. Appli­ca­tions in Energy and Light­ing for Smart Build­ings, Auto­mo­tive, Health­care, etc. Down­load the workshop’s poster from here.